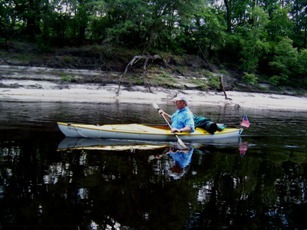 Live Oak, FL--The Fellow Travelers often have a good turn-out for the Memorial Day weekend trip and 2010 saw twenty-five paddlers assemble for the trip on the Suwannee. 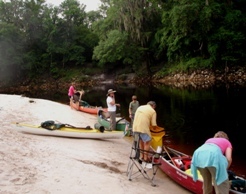 The group met at 9:00 AM a t the Spirit of The Suwannee Music Park boat ramp and began loading the boats. Brown Moseley made his second trip in his pretty yellow kayak, but everyone else partnered in tandem canoes. John Williams and Margie Massey, Art and Janice Shelfer, George and Carol Royal, Greg Baker and Sam Brown, Greg and Katie Ferrell, Jeniffer and Sean Ferrell, Ronnie and Kim Marchant, Lee and Lita Clifton, Paul Tolar and Olga Garcia, Daniel Butler and Liset Cruz, David Embrey and Gina Hager, and Charlie and Diane Stines along with the dog, Ami, made up the pairings in the twelve canoes. Olga, David, and Gina w ere rookies and it was the first overnight trip for Kim. Donna Ellis is still having some difficulty with her shoulder so she and Jerry were not able to make the paddle, but they were their usual kind and helpful souls. They shuttled the drivers and vehicles to the take-out at Gibson Park and then hauled the considerable load of food and cooking gear to the campsite at Holton Creek. The river was near normal level. The white sandbars were fully exposed and they glistened in the late May sun. The water was sufficiently placid to reflect the limestone banks, the ferns, and the trees. 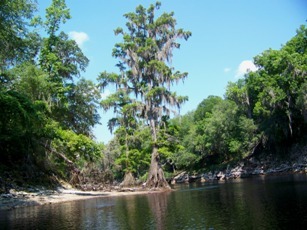 The Suwannee near Live Oak is generally twisting but without obstructions. The bottom can often be reached with the paddle but it is not so shallow as to require getting out o f the boats. Interesting wildlife is not the Suwannee’s strong suit. Aside from birds, one snake, and perhaps a very few turtles, the river was not populated with animals. Most of the paddlers took a long and refreshing break after paddling for about an hour, but Ronnie, Kim, Lee, and Lita were out of sight. The friends shared snack foods and watched the dog play and then reloaded for further paddling. The Clilftons and Marchants were the first to arrive at the pre-determined lunch spot at the Boys’ Ranch. Previous trips had always m ade the stop on the left bank at the ranch but the advance party stopped on a nice sandbar just beyond the ranch but on the right side of the river. It was really a better place for eating lunch. 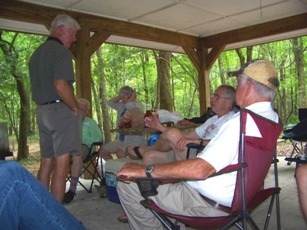 The twenty-five boaters got out, sat up the folding chairs, and took a long and leisurely lunch stop. After about an hour the final stretch of the Saturday trip commenced. 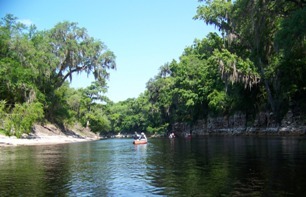 It did not take long to reach the Suwannee River Management District canoe camp at Holton Creek. The travelers had reserved the camp for twenty persons but found no campground host and most of the platforms occupied. However, the occupants were very nice and said they knew the site was reserved. They moved their camping gear and the platforms were then ready. Another couple from Jacksonville arrived later and did have a r eservation for one of the platforms. The campers pitched tents and then sat around enjoying intelligent conversation. The rookies-Olga, David, and Gina--got acquainted with the veterans. Jerry and Donna arrived with the food and cooking gear around 4:30 PM. 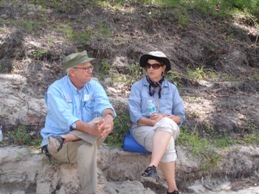 Frank Sutton and Lillian Baker also managed to find their way to the campsite to share the meal. The crowd was so large that two turkey fryers were needed to prepare the low country shrimp boil. Jerry and Charlie did the actual preparation but they were hindered by Art’s constant incorrect suggestions and demands. Greg Ferrell brought enough plates and utensils so that there were very few dishes to clean. The King made about half an urn of coffee for those who wanted it. The forecast called for a 60% chance of thunderstorms and the prediction materialized. The storm was severe but everyone was beneath the picnic shelter and no one got soaked. Since Donald May was not along the group had the privilege of hearing Charlie tell the town drun k story and of hearing Greg Baker tell the Prince Albert tale. Frank did not tell the monkey story. David and Gina were thoroughly questioned about their Maryland origins but were accepted into the group nonetheless. Eventually everyone retreated to the tents for the night’s sleep. The rain had made the temperature just right for sleeping. The rains stopped before morning. Sunday’s breakfast was not rushed. The electric urn took a long time to brew sixty cups of coffe but once the coffee was ready the preparation of breakfast began. Ronnie, Greg Baker, Art, and John cooked biscuits in D utch ovens, John and Sam scrambled eggs, Charlie made grits, and Margie supplied nice fresh fruit. After breakfast some of the campers availed themselves of the hot showers and then it was time to head to the take-out. 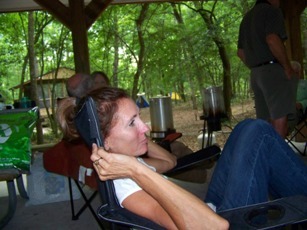 The trip to Gibson Park was much like the Saturday paddle--nice scenery, no rain, almost no wildlife. Greg and Sean Ferrell ventured up Holton Creek to the first magnitude spring but it was not clear. 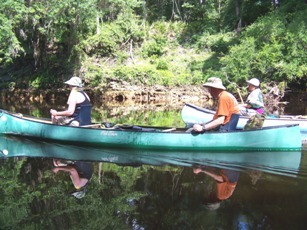 Several paddlers did paddle against strong current up to the Alapaha Rise Spring but found it to be cloudy. Upon reaching Gibson Park the vehicles were retrieved from the put-in and the Exhibition was brought back from the woods where it had been hidden near the campsite. Everyone loaded canoes and went home from a very good river trip.